With BoardConnect by Lufthansa Systems, passengers can access the airline's entertainment program during the flight with their own tablets and smartphones via streaming technology. The flexible state-of-the-art inflight entertainment solution enables airlines to lift their passengers travel experience to an entirely new level with an almost negligible lead-time. In addition to the permanently installed traditional inflight entertainment solution BoardConnect, there is also a flexible version, BoardConnect Portable. It combines all technical components within a single device, which can be installed quickly and easily in every aircraft. This portable solution was introduced last year by Eurowings, who were able to use it to equip the entire fleet with a range of entertainment options within the space of a weekend. Last but not least, BoardConnect Plus rounds off the portfolio with its internet service. The core of the digital BoardConnect platform is its open architecture. With the help of new technologies, BoardConnect becomes a kind of cloud provider above the clouds. It enables airlines to operate their own applications in the aircraft on the basis of BoardConnect. This also applies to applications by external airline partners and supports new areas of application for crew and passengers. "Our digital BoardConnect platform is much more than just an Inflight entertainment solution. With it, airlines can improve their passenger's on-board digital experience considerably, and further personalize the services", says Jan-Peter Gänse, Director of Project & Certification at Lufthansa Systems. After all, the future of on-board entertainment is now inconceivable without internet, because internet access on board is the prerequisite for real-time communication, the streaming of live events, and additional services by external partners. Accordingly, the issue of connectivity will remain the focus at Lufthansa Systems – for airlines both within and outside of the Lufthansa Group. Among other things, the aviation IT specialist is currently equipping the fleets with broadband internet for short- and medium-haul flights by Lufthansa, Eurowings and Austrian Airlines, in collaboration with its partners Inmarsat and Lufthansa Technik. Passengers can already use the internet on 60 Lufthansa and Austrian Airlines aircraft operating within Europe. At Lufthansa, BoardConnect functions as the system linking the network provider Inmarsat with the FlyNet portal, the user interface for passengers. At Eurowings, BoardConnect Portable is to be gradually replaced by BoardConnect Plus and will be offered to passengers for internet access under the name WingsConnect. All 31 Airbus aircraft at Austrian Airlines have already been equipped with internet provision. 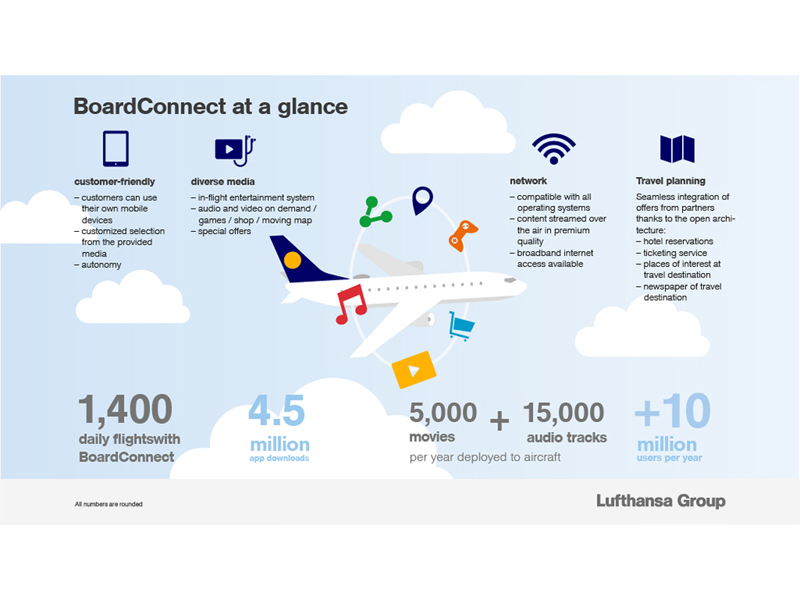 Subtitle on the infographic: Airlines within and outside of the Lufthansa Group use various different versions of the BoardConnect platform. Non-group customers are e.g. Virgin Australia, EIAI, Neos, Azul and Aircalin.